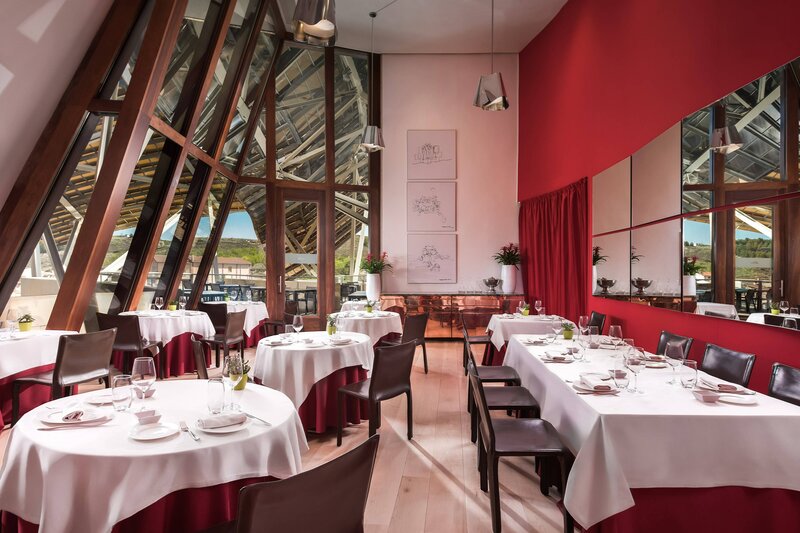 Treat yourself to delicious food in our Michelin-starred Marqués de Riscal Restaurant or in our "1860 Tradición" Restaurant with panoramic views over the Cantabrian Mountains. Discover all Marqués de Riscal wines in the Vinoteca & Bistro or chill out at any time of day with a coffee, cocktail or glass of wine in our top floor Library Lounge. After a superb meal, relax by simply taking your favorite drink to the rooftop lounge and library. Or enjoy the serene ambience of the hotel’s wine bar, Vinoteca & Bistro, where a delightful menu of light bites is also available. A selection of the 1860 Tradición dishes and other culinary delights may also be found on our in-room dining menu. 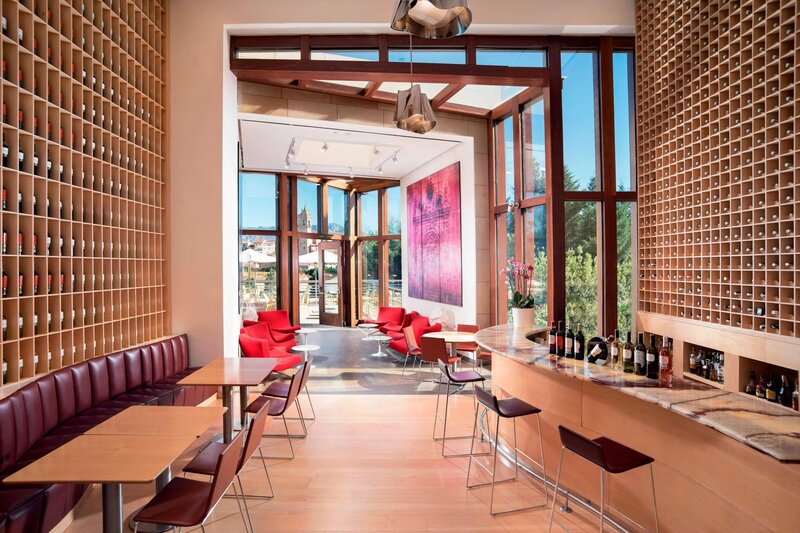 Regardless of where our guests choose to dine, the stunning juxtaposition of Gehry’s iconic designs with the picturesque views of rolling vineyards creates unforgettable backdrops for an array of multi-layered gourmet experiences. The 1860 Tradición&apos;s architectural renderings are by Gehry. 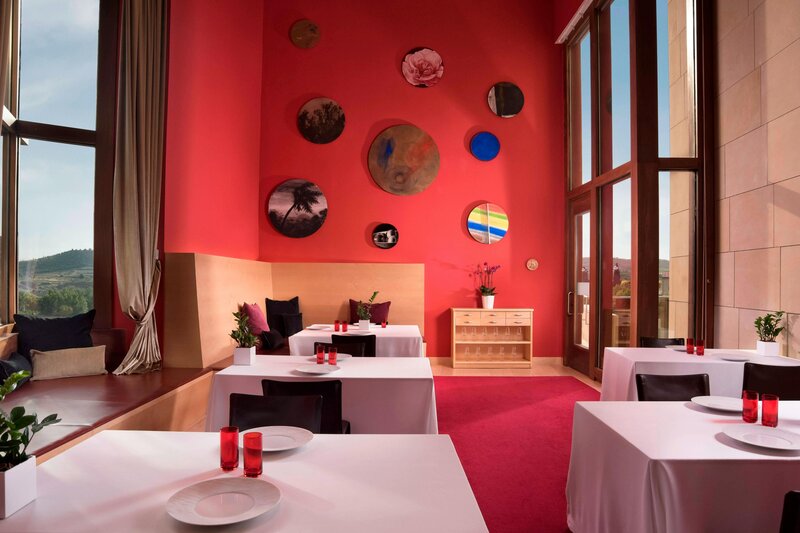 Panoramic views of the vineyards and Elciego decorate our airy, second-floor restaurant. 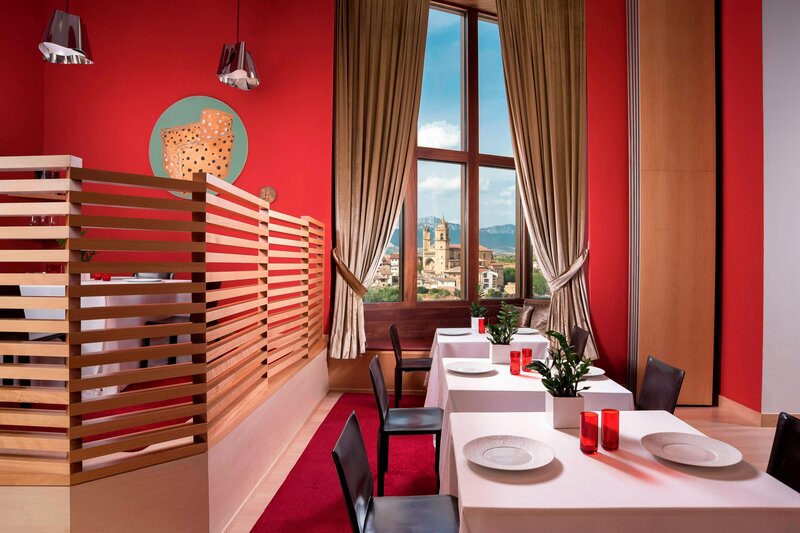 Our less formal, but equally delicious, 1860 Tradición offers refined regional specialties a la carte. 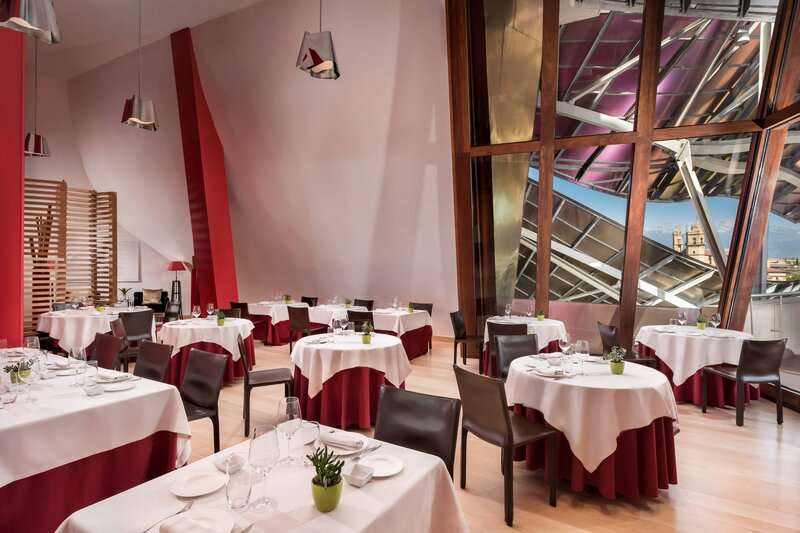 Awarded a Michelin star and two Repsol Sun, Restaurante Marqués de Riscal offers the finest regional cuisine blended exquisitely with modern touches. Its extensive selection of wines creates the perfect complement to this exceptional culinary journey. 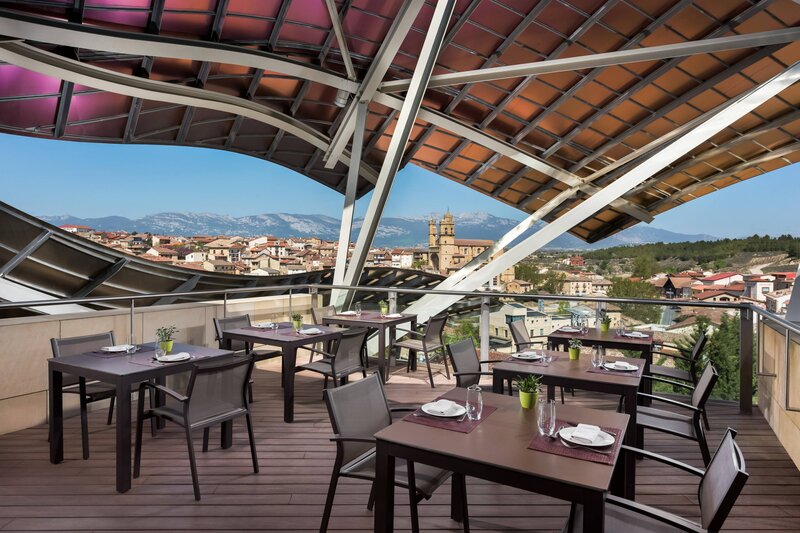 Located just off the main lobby, the hotel bar is a great place to relax with friends while sampling some of the fine vintages from the Marques de Riscal wine estate. The bar also offers a wide range of cocktails, beers and a selection of light bites. Two distinct concepts revolving around wine, local products and modern cooking techniques can be found at the four spectacular venues. The gastronomic consultant to both 1860 Tradición and the gourmet Restaurante Marqués de Riscal, where he was awarded a Michelin star. 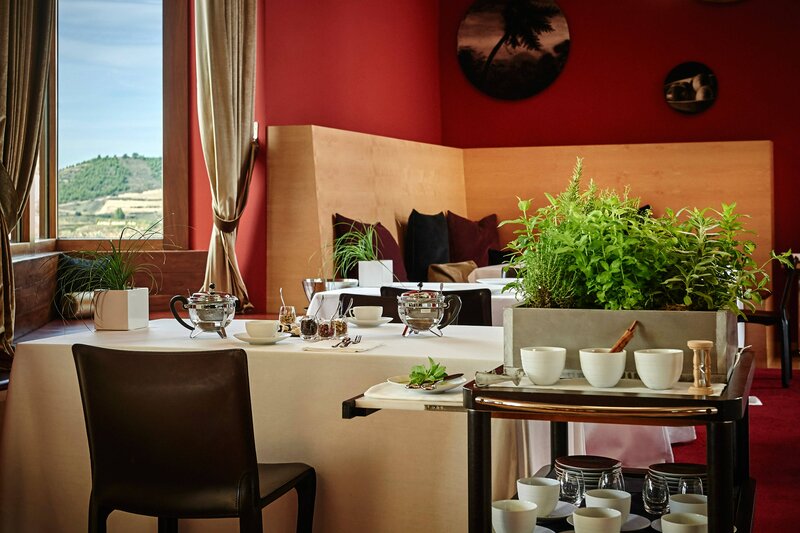 This celebrated Riojan chef has also been awarded two Michelin stars for his culinary work at El Portal del Echaurren Restaurant.